Named for the Streicher Sisters' signature beauty service, this lightning bolt is that unique kind of symbol that mixes perfectly with the rest of your studs AND stands out. Order two and double up in one ear. Earring measures 10mm x 6mm, just under 1/2" x 1/4"
This earring is made to order. Please allow approximately 4 weeks for production and delivery. Need your item sooner? Call or text (424) 442-0652. …to hear about new designers and promotions! © 2019 ICONERY. All rights reserved. To determine your wrist size, wrap a sewing tape measure around the part of your wrist that you plan to wear the cuff. It should fit snug, but not tight. If you don’t have a sewing tape measure, use a piece of string or strip of paper instead, and mark where one end of the string or paper overlaps the other. Then measure that length with a ruler. The thickness of a cuff can affect the circumference you prefer to wear. Thinner cuffs can be worn ¼” smaller in circumference, as they take up less space on your wrist. The cuff’s opening should be about 1 inch. If you have a ring that fits the finger you want sized, match it to one of the circles on this sizing tool to find your U.S. ring size. You can also wrap a piece of string or strip of paper snugly, though not tightly, at the base of your finger, slightly below the middle knuckle. Mark where the string or paper meets and measure the length with a ruler, in millimeters. Look at the chart under "Inside Circumference" for your U.S. ring size. 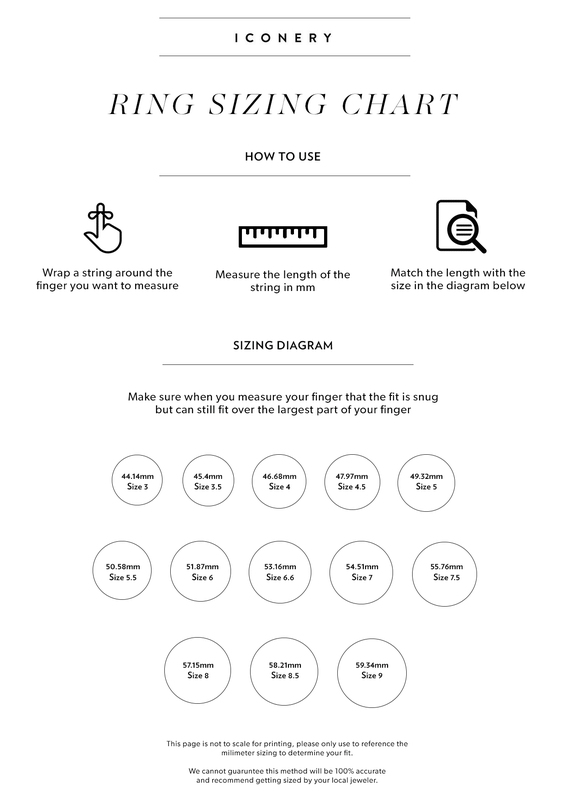 Measure your ring size when your fingers are warm, generally at the end of the day. Measure multiple times to be sure you’ve got the right size. Don’t forget the ring needs to be able to slide past the knuckle. If your ring size falls between two sizes, it’s safer to go with the larger size, especially if you're buying a ring with a thicker band.